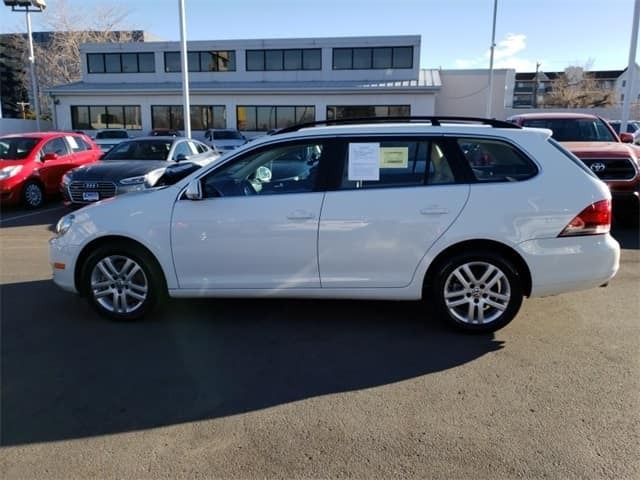 CPO 2014 Volkswagen Jetta SportWagen for sale at Emich VW in Denver. At Emich Volkswagen in Denver, Colorado we have a great inventory of Certified PreOwned Volkswagen vehicles that work with just about any budget! One of our current selections is this gently used 2014 VW Jetta SportWagen – with a price tag of just under $15,000. It has just over 30,000 miles on it and this wagon still has plenty of life in its energetic 2.0L TDI Diesel Turbocharged engine. That paired with a 6-Speed Automatic DSG transmission, provides an estimated 29 MPG city/39 MPG highway fuel economy! Some of the other features you can look forward to include Bluetooth connectivity, rearview camera, Sirius XM Satellite Radio, heated front seats, and Electronic Stability Control. This one-owner clean CarFax wagen also gives you peace of mind with a 2-yr/unlimited mile warranty! So stop into Emich Volkswagen today to take a look and even take a test drive!